The Kerry Bog Village Museum, located on the beautiful ‘Ring of Kerry’, gives people an insight into how people lived and worked in Ireland in the 18th Century. The village is the only one of its kind in Europe. Annascaul (or Anascaul) is a village in the heart of the Dingle Peninsula: situated close to both the Slieve Mish mountains and the long sandy beach at Inch, it is a popular area for walkers. It is also home to a number of pubs and acccommodation providers. The Slea Head Drive is a circular route, beginning and ending in Dingle, that takes in a large number of attractions and stunning views on the western end of the peninsula. The route is clearly labelled by road signs throughout its length. To properly enjoy the Drive, a half-day should be set aside for the journey. Valentia Island is one of Ireland’s most westerly points lying off the Iveragh Peninsula in the south-west of County Kerry. It is linked to the mainland by the Maurice O’Neill Memorial Bridge at Portmagee. A car ferry also departs from Reenard Point to Knightstown, the island’s main settlement, from April to October. The permanent population of the island is 665 and the island is approximately 11 kilometres long by almost 3 kilometres wide. Derrynane is a village in County Kerry, Ireland, located on the Iveragh peninsula, just off the N70 national secondary road near Caherdaniel on the shores of Derrynane Bay. Also Trundle outbreak zone. Moll’s Gap is a pass on the N71 road from Kenmare to Killarney in County Kerry Ireland. 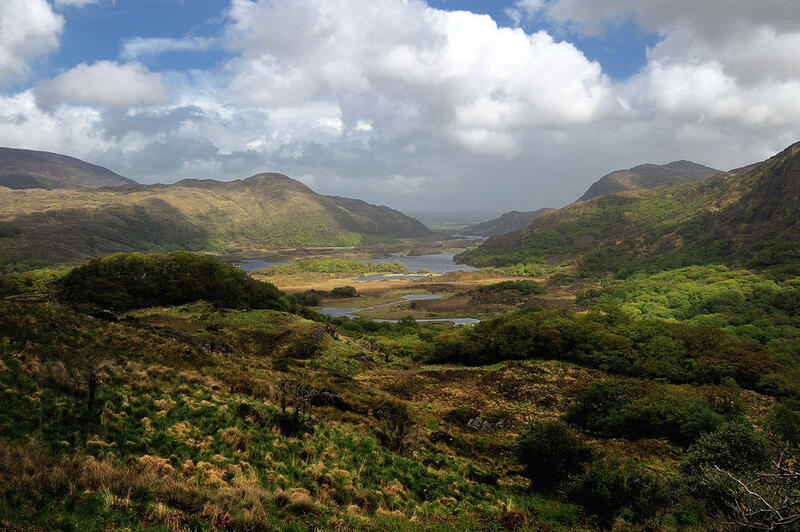 On the Ring of Kerry route, with views of the Macgillycuddy’s Reeks mountains, the area and its shop is a panoramic spot visited by thousands of tourists each year. The rocks at Moll’s gap are formed of Old Red Sandstone. Sneem is a village situated on the Iveragh Peninsula in County Kerry in the southwest of Ireland. It lies on the estuary of the River Sneem. National route N70 runs through the town. Torc Waterfall is approximately 7 kilometres from Killarney Town and approx 2.5 kilometres from the motor entrance to Muckross House and can be accessed from a car park on the N71 better known as the Killarney – Kenmare road. A short walk of approx 300 metres brings you to the waterfall. Waterville is a village in County Kerry, Ireland, on the Iveragh Peninsula. The town is sited on a narrow isthmus, with Lough Currane on the east side of the town, and Ballinskelligs Bay on the west, and the Currane River connecting the two. Muckross House is located on the small Muckross Peninsula between Muckross Lake and Lough Leane, two of the lakes of Killarney, 6 kilometres (3.7 mi) from the town of Killarney in County Kerry, Ireland. In 1932 it was presented by William Bowers Bourn and Arthur Rose Vincent to the Irish nation. It thus became the first National Park in the Republic of Ireland and formed the basis of the present day Killarney National Park.